"Pending stunning new developments, I believe the catalyst occurred in 2008. It's a date that is looking better and better as time goes by. The year 2008 marked the onset of the most serious U.S. economic crisis since the Great Depression. It also marked the election of Barack Obama, which could yet turn out to be a pivotal realignment date in U.S. political history. In fact, if I had to give the catalyst a month, I would say September of 2008. The global Dow was in free fall. Banks were failing. Money markets froze shut. Business owners held their breath. 9/11 will go down as one of the more famous crisis precursors in American history. A crisis precursor is an event that foreshadows a crisis without being an integral part of it. Other such precursors in American history include the Stamp Act Rebellion (1765), or Bleeding Kansas (1856), or perhaps the Red Scare (1919)." The initial spark has triggered a chain reaction of unyielding responses by those in power, including: handing $700 billion of taxpayer funds to the Wall Street bankers whose reckless pervasive greed and fraudulent derivative products caused the worldwide conflagration, 0% interest rates for the last seven years, a quadrupling of the Federal Reserve balance sheet to $4 trillion through QE to infinity, government stimulus spending which increased the national debt from $10 trillion to $18 trillion in seven years, ongoing $600 trillion annual deficits, using fraudulent accounting to disguise the insolvency of the Too Big To Fail Wall Street banks, and a conscious choice by corrupt politicians and captured government regulators to not prosecute one criminal banker. None of these initial responses have solved any of our pervasive problems or averted further emergencies. Not only haven't these responses resolved the intractable economic conundrums facing the world, but they have exacerbated the next round of monetary disasters rapidly approaching. Strauss and Howe predicted the initial catalyst event would not worsen into a full-fledged catastrophe because the powers that be would find a way to avert the initial danger and stabilize the situation "for a while". The key point was those benefiting from the existing corrupt world order would do whatever it took to temporarily forestall a calamity which would result in their downfall, loss of power, and ultimate imprisonment. They have successfully delayed the regeneracy phase of this Fourth Turning by turning on the monetary debt spigot full throttle. It is highly unlikely we will have a resolution to this Crisis period for at least another ten years, so if you think the worst is over you are badly mistaken. If the climax is somehow accelerated like the Civil War, it will likely result in bloody wars, with a horrific death toll. The five year lull can be viewed as the world passing through the eye of an immense hurricane. There will always be ebbs, flows and lulls within a 20 year long Crisis, as seen in previous Fourth Turnings. The Boston Tea Party catalyst spark occurred in December 1773, but the fireworks didn't get going until 1775 and the regeneracy Declaration of Independence event in 1776. The Civil War Fourth Turning had no lulls. The catalyst election of Abraham Lincoln to the regeneracy event of the First Battle of Bull Run was only nine months. The acceleration did not allow for cooler heads to prevail. The result was ghastly death and destruction. The 1929 Stock Market Crash catalyst was followed by a three year lull until FDR's election and New Deal programs marked the regeneracy. In my previous four part article Fourth Turning - The Shadow of Crisis Has Not Passed written early in 2015 I attempted to explain generational theory, provided evidence we are still early in this Crisis, pondered the potential clash between the citizens and our debased, dysfunctional, captured government, and contemplated the kind of war which will thrust the world through the gate of history towards an uncertain future. The misconceptions regarding generational theory and the Fourth Turning keep a vast swath of otherwise lucid thinkers from understanding the implications of generational mood changes which drive the cyclical nature of history. The cognitive dissonance and normalcy bias of most Americans blinds them to the lessons of history and leaves them vulnerable to the winter that has beset the nation. The Fourth Turning is not a prophecy or some Nostradamus like predictions. It's a logical theory based upon the average time span of a long human life and the four phases of that life: childhood, young adulthood, mid-life, and old age. The interaction of generations during their phases of life is what produces the profound mood changes throughout history. The dramatic events during the course of antiquity are less important than how society responds to them. The reaction is substantially determined by the season of the saeculum and the generational mood that aligns with that season. We've entered the Winter season, with bitterly cold days ahead and intense blizzard-like conditions forecast for the next decade. The ignorance of linear thinking advocates regarding the cyclical nature of history is either due to their "progressive" public educational brainwashing or their intellectual inability to grasp the obvious. 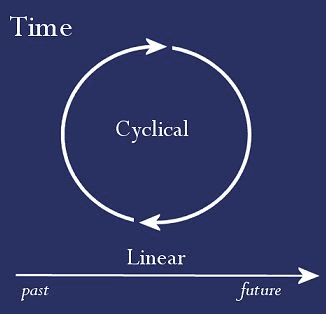 Our daily existence is cyclical with 24 hours in a day, 365 days in year based upon earth's orbiting the sun, 12 months divided into four seasons, and the circle of life - birth through death is the ultimate cycle perpetuating life on this planet. There are dozens of astronomical, mathematical, religious, sleep, agricultural, social, economic and war cycles known to man. 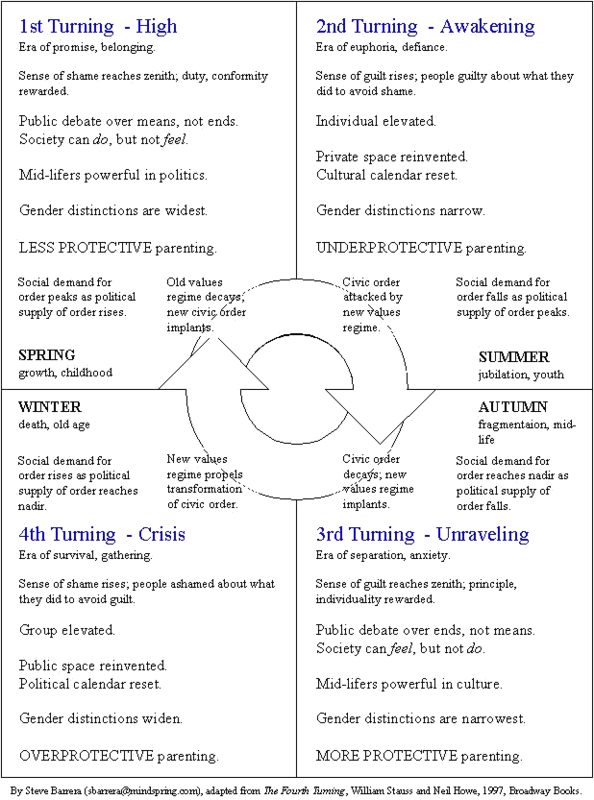 Martin Armstrong has a cycle theory predicting the collapse of government between 2016 and 2020. The Kondratiev Wave theory and Elliott Wave Theory are preached by "experts" and followed by millions. Of course, many of these "experts" are busy selling their predictions in newsletters to make a buck. The thought leaders in academia, politics, business, and mass media perpetuate the myth of never ending linear progress created by technological advances and the ever increasing intellectual evolution of mankind. The hubris of these people is incomprehensible when viewing history. The myopic delusions of these arrogant egotists are easily shattered by the horrific regressions of history. Were the Great Depression and the 65 million people killed during World War II progress for mankind? Was Stalin's murder of 20 million Russian peasants a linear progression? Was Mao's Great Leap Forward murder of 45 million Chinese peasants really a leap forward? Was the death of 5% of the U.S. male population in the space of four years during the Civil War really progress? Mankind and civilization do not advance in a straight line. Progression and regression alternate in a cyclical fashion. As generations die out, memories of the previous cycle are forgotten, and the mistakes are repeated again. Human nature does not change. Good, evil, greed, fear, bravery, honesty, arrogance, sacrifice, and truth intermingle to drive humans through the cycles of history. "As the Crisis catalyzes, these fears will rush to the surface, jagged and exposed. Distrustful of some things, individuals will feel that their survival requires them to distrust more things. This behavior could cascade into a sudden downward spiral, an implosion of societal trust." "But as the Crisis mood congeals, people will come to the jarring realization that they have grown helplessly dependent on a teetering edifice of anonymous transactions and paper guarantees. Many Americans won't know where their savings are, who their employer is, what their pension is, or how their government works. The era will have left the financial world arbitraged and tentacled: Debtors won't know who holds their notes, homeowners who owns their mortgages, and shareholders who runs their equities - and vice versa." Regeneracy - Where Art Thou? The regeneracy during a Fourth Turning is when a sense of urgency about institutional dysfunction and civic vulnerabilities coalesce the nation or large blocs of the homeland behind a strong leader to tear down the existing social, economic and cultural order and replace it with something different. The different can be better or far worse. The Declaration of Independence, First Battle of Bull Run, and election of FDR marked the regeneracy in prior American Fourth Turnings. They all occurred within four years of the initial catalyst. It is now seven years into this Fourth Turning and a clear regeneracy event has not materialized. This has been a frustrating development for those who are impatient to get this Fourth Turning moving at a quicker pace. But, each Fourth Turning will proceed at its own pace dependent upon events, the country's reaction to those events, and the leaders we choose during the Crisis. Neil Howe, in his 2012 essay pondered the regeneracy issue and described it more as an era than an event. It requires something dramatic that unifies the country or causes the people to break into separate unified factions. "I think it's pretty obvious that the regeneracy has not yet started. So how long do we need to wait for it? And how will we know when it starts? Those are good questions. 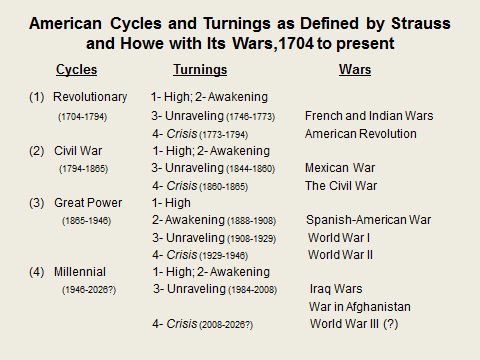 I recently went back over The Fourth Turning to recall how we dated the stages of the each of the historical 4Ts. And I found that we were very explicit about dating the other three stages (catalyst, climax, and resolution) for each 4T. But we were always a bit vague about dating the regeneracy, treating it more like an era than a date. There is a reason for this. We may like to imagine that there is a definable day and hour when America, faced by growing danger and adversity, explicitly decides to patch over its differences, band together, and build something new. But maybe what really happens is that everyone feels so numb that they let somebody in charge just go ahead and do whatever he's got to do. I'm thinking of how America felt during the bleak years of FDR's first term, or during Lincoln's assumption of vast war powers after his repeated initial defeats on the battlefield. The regeneracy cannot always be identified with a single news event. But it does have to mark the beginning of a growth in centralized authority and decisive leadership at a time of great peril and urgency. Typically, the catalyst itself doesn't lead directly to a regeneracy. There has to be a second or third blow, something that seems a lot more perilous than just the election of third-party candidate (Civil War catalyst) or a very bad month in the stock market (Great Power catalyst). We are still due for such a moment. We have not yet reached our regeneracy. When it happens, I strongly suspect it will be in response to an adverse financial event. It may also happen in response to a geopolitical event. It may well happen over the next year or two. Given the pattern of historical 4Ts, it is very likely to happen before the end of the next presidential term (2016)." As previously stated, The Fourth Turning does not predict what series of events will trigger a regeneracy. It lays out a generational framework regarding how generations will react to the events. As Howe points out, the regeneracy requires a 2nd or 3rd blow which seems even more perilous than the initial shock. His suspicion that it will be in response to an even worse financial debacle than 2008 and very likely to happen before the next election in 2016 appears to be dead on. The oblivious trusting masses will again be shocked and bewildered when the second devastating shock wave of this Crisis strikes in the next twelve months. The next global financial meltdown, caused by the Federal Reserve, along with central bankers in Europe, Japan and China, will create a fearful panic and an intense urgency for a strong self-assured leader who promises to rescue the nation from peril. The panic will coincide with the presidential election in November 2016. The "Great Divider" Barack Obama squandered his chance to be the leader who united the nation when he proved to be nothing more than a captured political hack, bowing down to the corporate fascist establishment, while stirring wide spread resentment with his culture war rhetoric and inability to inspire confidence with his toothless hope and change sloganeering. His failure to reign in or prosecute the greedy sociopathic Wall Street criminals, his acquiescence to the military industrial complex by expanding our war mongering and sowing chaos in the Middle East, and his total disregard for fiscal restraint as the country's long term financial picture rapidly deteriorates, proved that he would not be the Fourth Turning Grey Champion leader. In retrospect, neither McCain nor Romney would have united the country, as they are both crony capitalist establishment figures. The mood of the country has darkened substantially in the last year as people are fed up with their deteriorating economic circumstances, sick of both political parties, and angry at the unrestrained illegal immigrant invasion on our southern border. I'm beginning to believe the nation will not be unified behind a common cause when the coming financial eruption unleashes molten lava of chaos, punishing economic distress, civil strife, class warfare, race wars, and ultimately global war. As Strauss and Howe foretold, the establishment (aka corporate fascist military industrial surveillance state) has seen a sequential loss of popular trust as their blatant corruption, sociopathic stranglehold on the levers of power, and unrelenting greed have angered the critical thinking aware citizens of this country. The next leg down in this Greater Depression will sever the remaining trust, disintegrating any remaining support for the existing civic order. What comes next will be heavily dependent upon whether the 5% to 10% of liberty minded believers in the Constitution are able to gain the trust of the masses. The odds will be long, but no longer than they were during that bitter winter at Valley Forge in 1777-1778. "It could be a series of downward ratchets linked to political events that sequentially knock the supports out from under the residual popular trust in the system. As assets devalue, trust will further disintegrate, which will cause assets to devalue further, and so on. Every slide in asset prices, employment, and production will give every generation cause to grow more alarmed. With savings worth less, the new elders will become more dependent on government, just as government becomes less able to pay benefits to them. Before long, America's old civic order will seem ruined beyond repair." In Part 2 of this article I will ponder possible Grey Champion, prophet generation leaders who could arise during the regeneracy, try to assess which channels of distress are likely to burst forth with the molten ingredients of this Fourth Turning, and lastly make some guesses about potential climaxes.